Create housing for several birds at once using the Wing and A Prayer Gardenia House. This hexagonal dwelling has three individual apartments, creating room for a few birds at one time. Each apartment has its own 1.5" diameter entrance hole, with a metal predator guard which matches the copper colored roof to prevent the holes from being enlarged. A small ledge around the base of the house offers perching for fledglings, and recessed lines on the side panels add an architectural feel. Offset sides prevent territory disputes between birds, giving each avian family their own entrance and ledge. 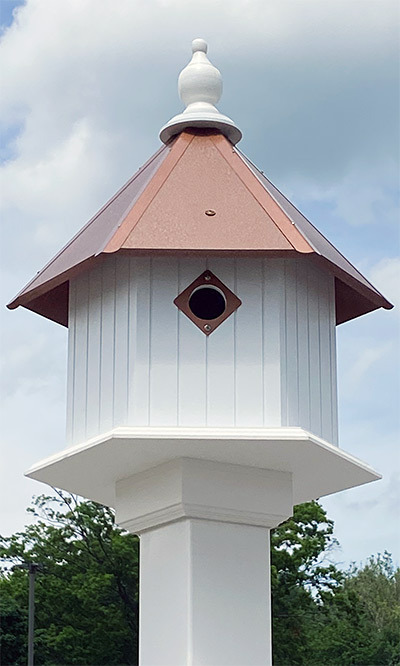 The copper color and hammered finish on the metal roof brings a surprising bit of detail to the piece, and a large white finial tops the unit. The home is crafted from solid PVC trimboard, which will not mildew, mold, or delaminate, for a stable home for up to 25 years. The roof may be removed for nest checks and cleaning, and the interior walls lift out easily. Use the preinstalled mounting collar to attach this home to a 4" x 4" post (not included) for height and stability. Place the Gardenia House in your yard for a dramatic and functional roost for years to come. Made in the USA.